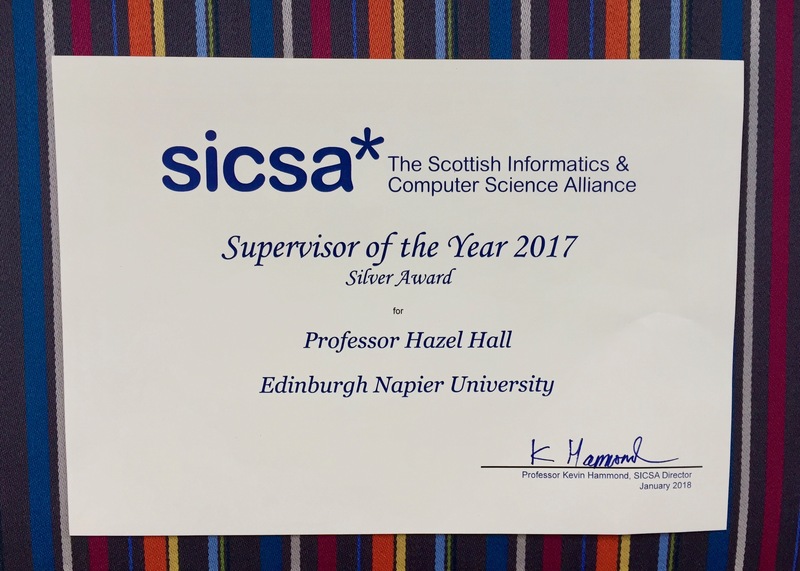 In summer 2017 all the PhD students in academic departments that hold membership of the Scottish Informatics and Computer Science Alliance (SICSA) were invited to recognise the fantastic work of their supervisors by making nominations for a new prize: the SICSA Supervisor of the Year Award. Around 50 academics from 10 universities were nominated by PhD students for the award. Following consideration of the students’ submissions, on 3rd October 2017 SICSA announced that Professor Stephen Brewster of the University of Glasgow was the winner. Three months later, on Friday 12th January, a delegation that comprised SICSA Director Professor Kevin Hammond, SICSA Executive Officer Steven Kendrick, SICSA Executive Assistant Aileen Orr, and SICSA Director of Knowledge Exchange Alistair Lawson visited my office on campus. They brought the news that there was also a runner-up (silver) prize for the Supervisor of the Year Award, and that I was the winner. Needless to say, I was delighted to hear this news on a dull day in January, and also very grateful to the (anonymous) PhD students who nominated me for this award. This entry was posted in Awards, PhDs and tagged Aileen Orr, Alistair Lawson, award, Kevin Hammond, PhD, Scottish Informatics and Computer Science Alliance, SICSA, Stephen Brewster, Steven Kendrick, students, supervisor, University of Glasgow, University of St Andrews by Hazel Hall. Bookmark the permalink.